Cane Creek Forty, Threadless Integrated, Sealed Bearings, Straight 1-1/8"
Optibike designs and custom configures a wide range of high performance electric bikes. Their founder, Jim Turner, is a former motocross champion with a design degree from Stanford University and experience in automotive at Ford Motor Company. His products are known for being powerful, tough, and different than the rest… In 2013, the company introduced a line of downspec’d models called Pioneer seres to meet a lower price point. 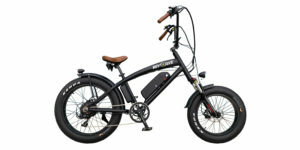 These ebikes utilized compact circular mid-drive motors that worked with cadence sensing pedal assist as well as throttle on demand. 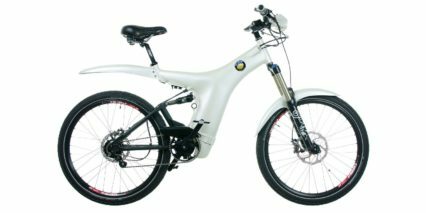 It was one of the first times I had ever seen a purpose built mid-drive that could handle a throttle, and the tubular downtube-mounted battery pack kept weight low and center for improved handling and balance. 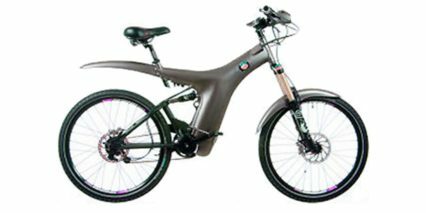 The Pioneer series has expanded with updates and refinements in recent years, there’s even a lightweight carbon fiber version now. 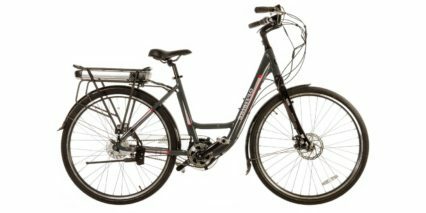 What you get with the Rocky Mountain Commuter is an offshoot of the Pioneer line with special attention paid to safety and comfort. 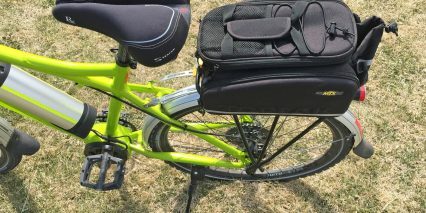 The frame is painted in attention grabbing high-visibility neon yellow, it comes with color-matched reflective stickers on the fenders and battery casing, has reflective fabric sewn into the the included Topeak convertible trunk bag pannier set, reflective and puncture resistant tires from Schwalbe, and two ultra-bright rechargeable LED lights from Serface with flashing strobe modes. 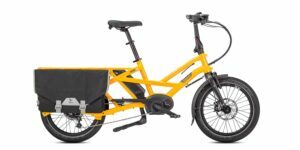 Not to mention, the bike ships with a handlebar-mounted side mirror, flick bell, full-coverage fenders with mud flaps, and extra wide platform pedals. 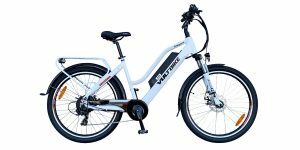 Whether you’re cruising to the grocery store on a sunny afternoon or fighting the wind and rain on an evening commute home from work, this bike will keep you safe and comfortable. 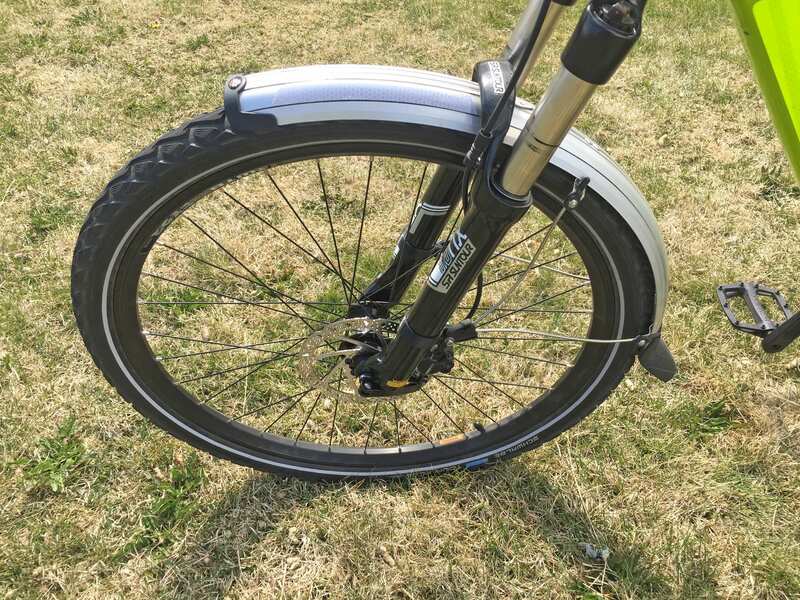 While the frame is only available in one size at this time, the downtube is sloped to lower standover height and I noticed that the rear rack is mounted far enough back that it won’t block the saddle from being lowered completely. 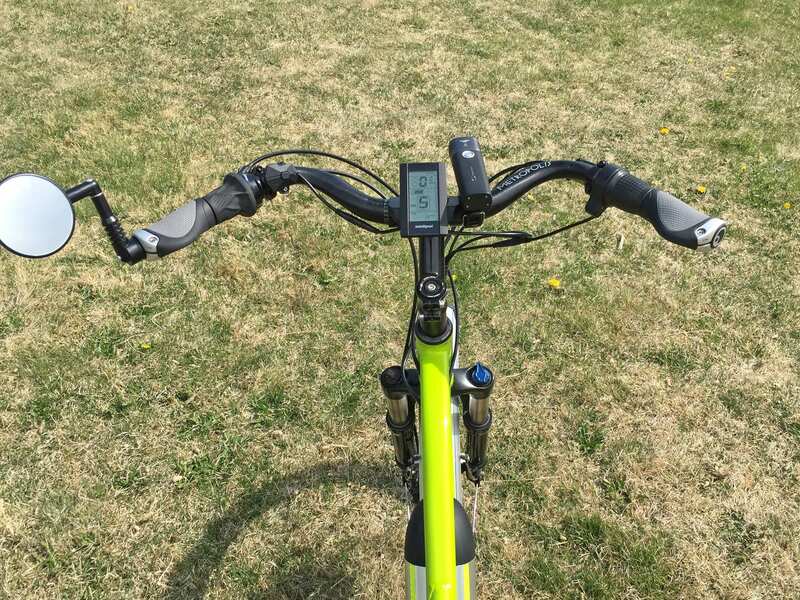 Five 10mm headset spacers and a 45-degree stem bring the handlebar up so you don’t have to lean forward, and the bar itself is swept-back to relax your shoulders and forearms. 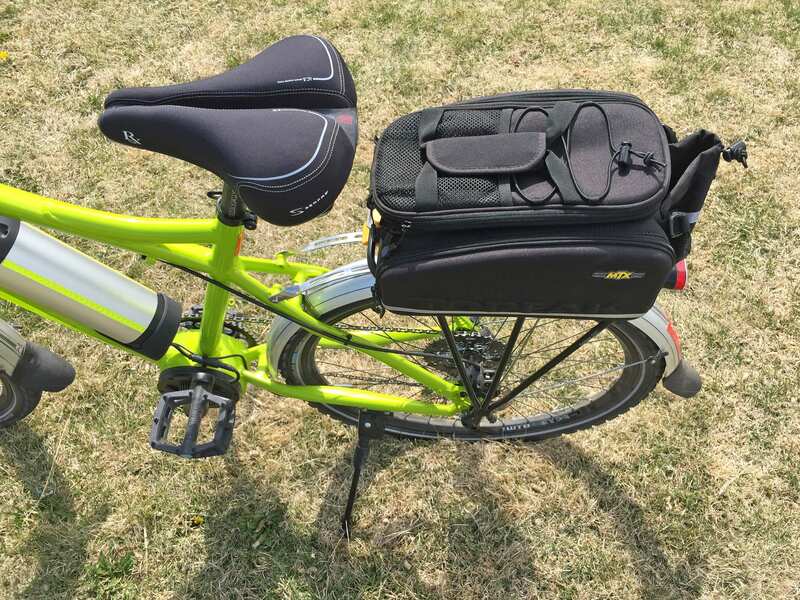 Premium locking ergonomic grips from Ergon reduce wrist strain (carpal tunnel syndrome and numbness), while the oversized gel saddle, wider 2″ tires, and 120mm suspension fork dampen vibration. 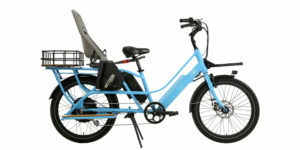 The two ares for possible improvement that I see in the way of durability, cleanliness, and comfort are a chain cover, chain guide, and suspension seat post. 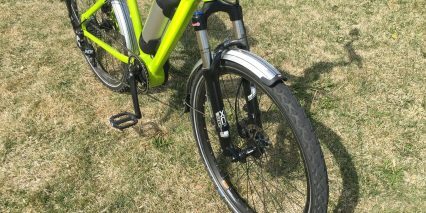 Oh, and the kickstand feels a little close to the left pedal path which could introduce the potential for heel strikes. Perhaps they will move it back on future models? 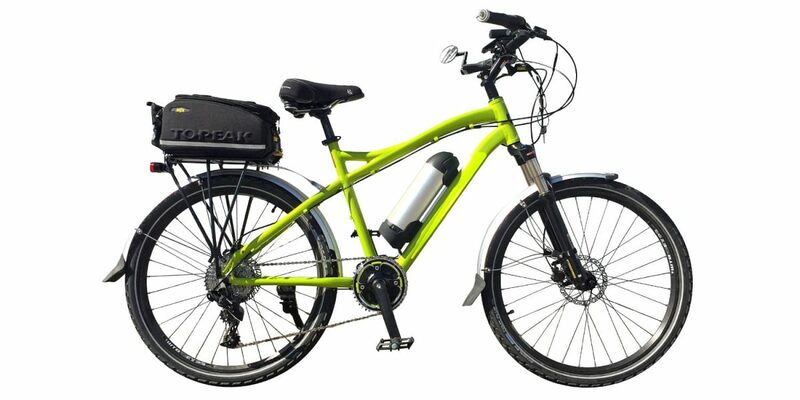 Driving this bike is a compact internally geared mid-motor that Optibike calls the MBB (motorized bottom bracket). 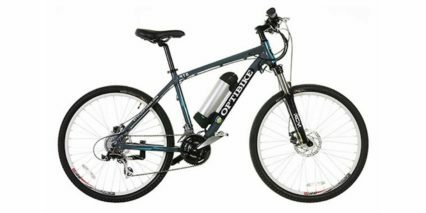 I didn’t get any details on who actually manufactures the motor, but Optibike refined the controller software in-house. I was told that nominal and peak output hover around 500 watts and peak torque is around 40 newton meters. These specs are on par with urban drive systems from mainstream competitors like Bosch, Yamaha, Shimano, Brose, Bafang, and Dapu. Only the two later brands offer throttle mode, and only Bosch offers shift detection. 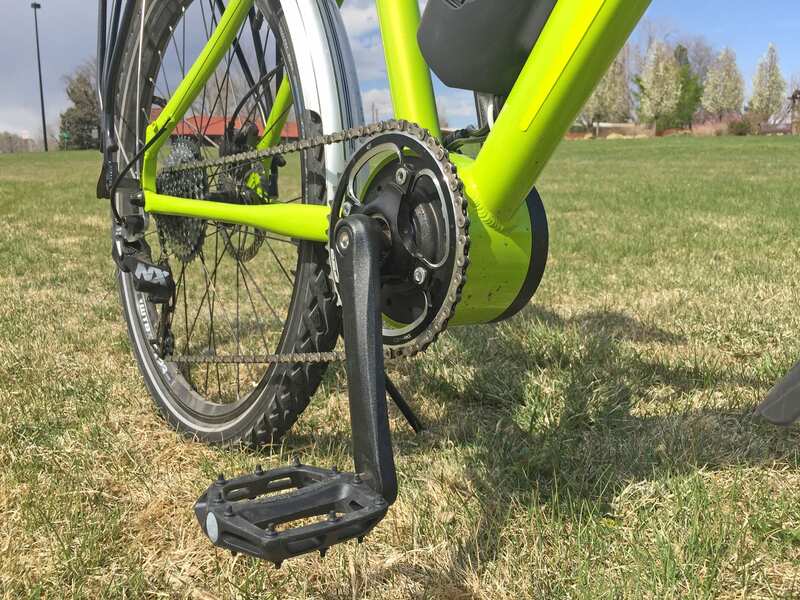 With the Optibike solution, you get a high resolution cadence sensor that listens for crank arm movement, and it felt pretty smooth. During my ride tests with Dusty, one of the shop technicians at Best Electric Bikes in Denver, Colorado, the bike started and stopped very smoothly. 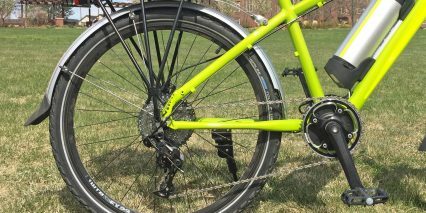 I didn’t notice a lot of gear mashing and I attribute that in part to the nicer SRAM NX drivetrain, which is roughly equivalent to Shimano Deore. 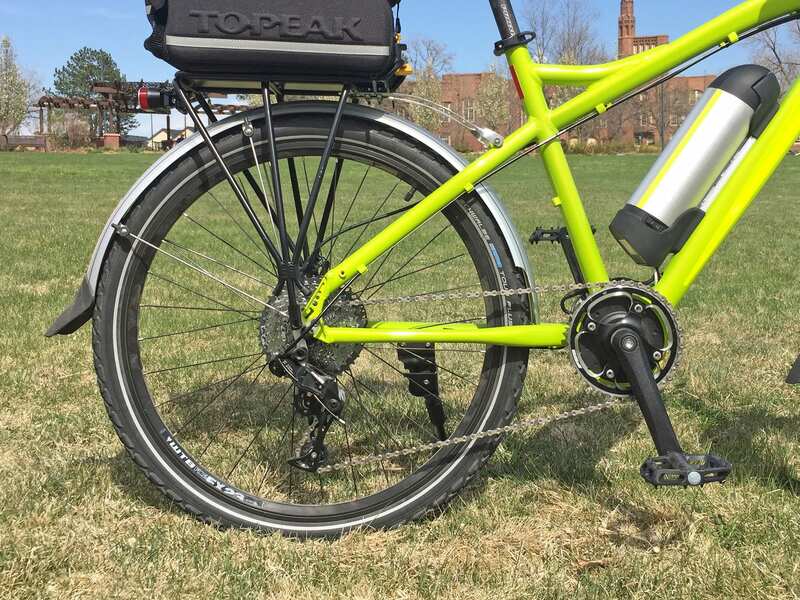 There’s plenty of power with this motor, but you have to shift gears thoughtfully in order to take advantage of it for starting and climbing. With 11 speeds at hand, I was able to reach and even exceeding the top assisted speed of 25 mph. 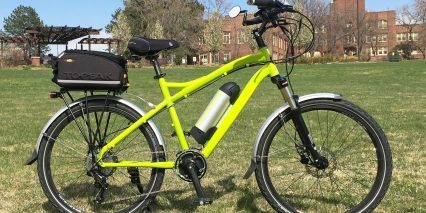 Most electric bikes top out at ~20 mph in the USA, but there is a special Class 3 designation that allows for up to 28 mph. 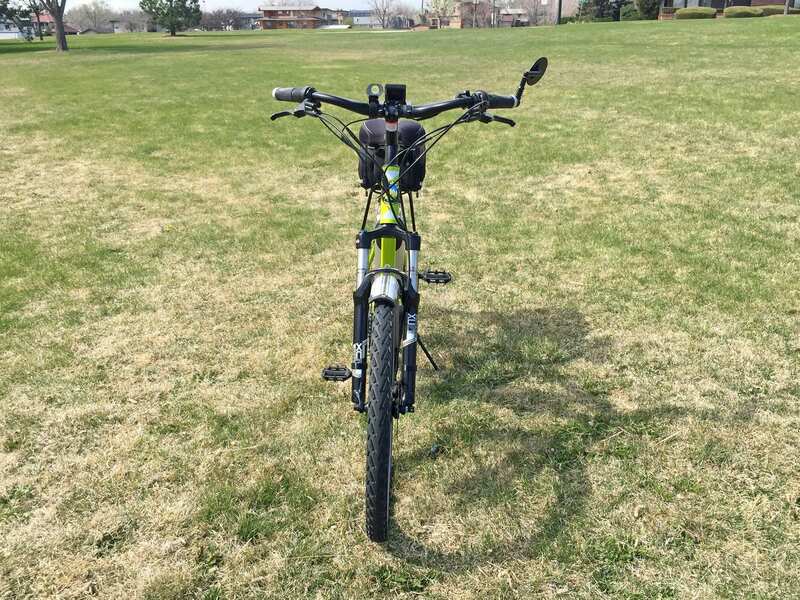 Optibike can configure the Rocky Mountain Commuter to be Class 1, Class 2, or slightly slower 25 mph Class 3 depending on your needs and the legal framework where you intend to ride. The demo model I tested was unlocked to 25 mph and had the throttle functioning up to 20 mph. 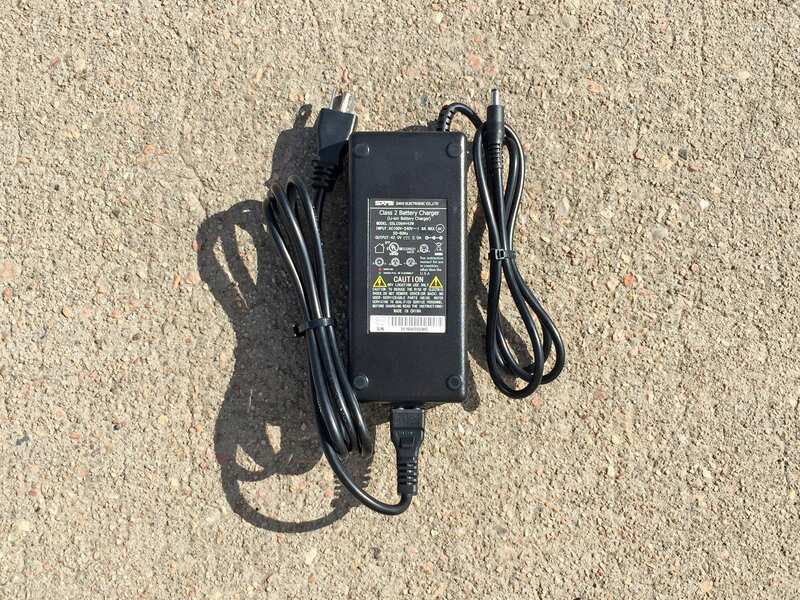 Note that the throttle on this product has been limited to 300 watts vs. the full 500 watts in order to conserve power and reduce drivetrain wear. The cockpit of the bike is fairly clean, despite all of the wires, because the RMC uses half-grip twist interfaces for both the gear shifter and throttle. I found this setup to be intuitive but noticed that shifting was not as quick as triggers could be, and that an older version of the RMC had an on/off toggle switch on the twist throttle housing. 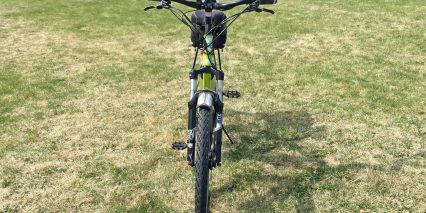 This was probably in place to de-activate throttle on demand (useful for bumpy sections of trail), but may have been removed to improve reliability. 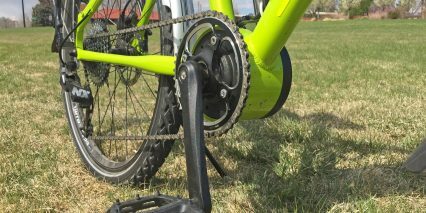 The 11 to 40 tooth cassette is great for urban environments and could probably handle light off road with steeper climbs as well. The motor is certainly capable and the wider tires wouldn’t slip as easily as they might otherwise. 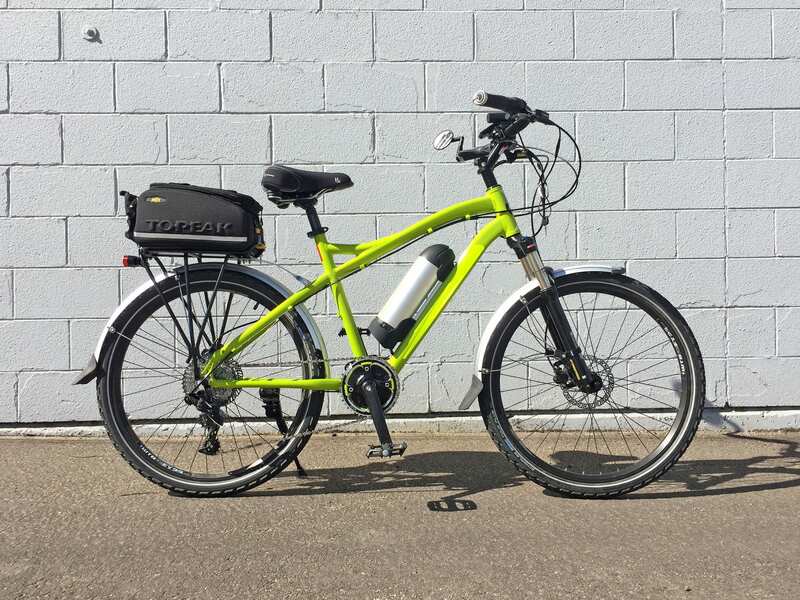 Powering the bike is a 37 volt 11.6 amp hour lithium-ion battery pack. 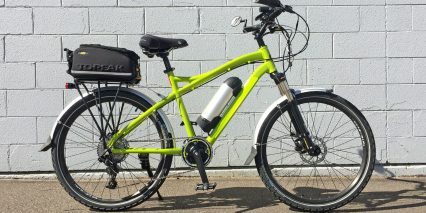 With a full capacity of roughly 429.2 watt hours, it’s a bit lower than average for the current generation of bikes that hover closer to 500 watt hours. That said, it’s also slightly lighter at 5.6lbs vs. 6+lbs. The casing is part aluminum alloy and part plastic. 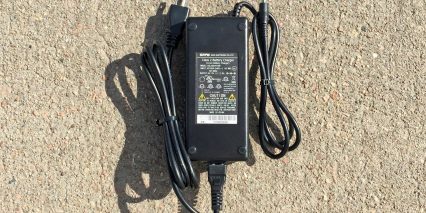 It has a five-LED charge level indicator on top and an on/off toggle switch on the right side. 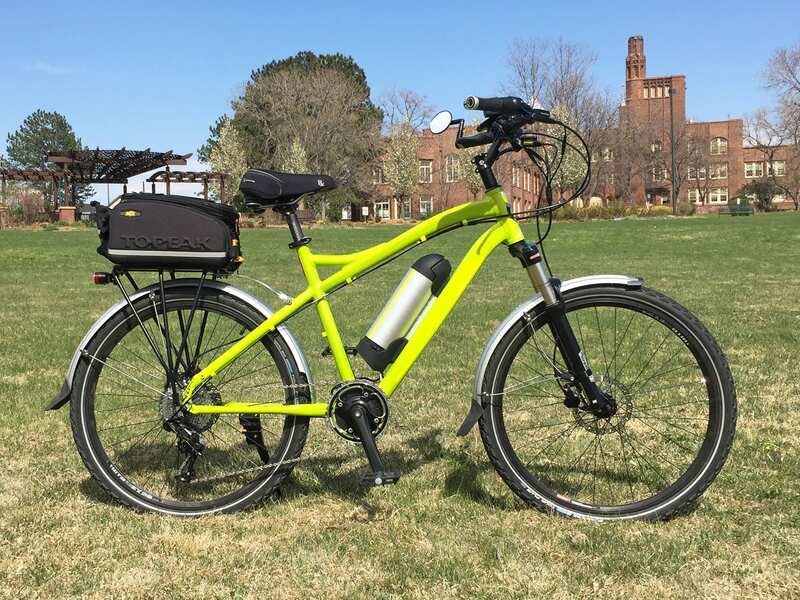 You can charge the battery on or off the frame, and Optibike includes a fairly standard 2 amp charger that would easily fit into the included trunk bag. 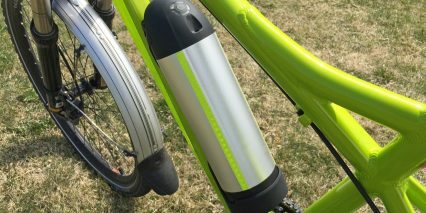 Two gripes that I have to share about this batter include how close it sits below the top tube. 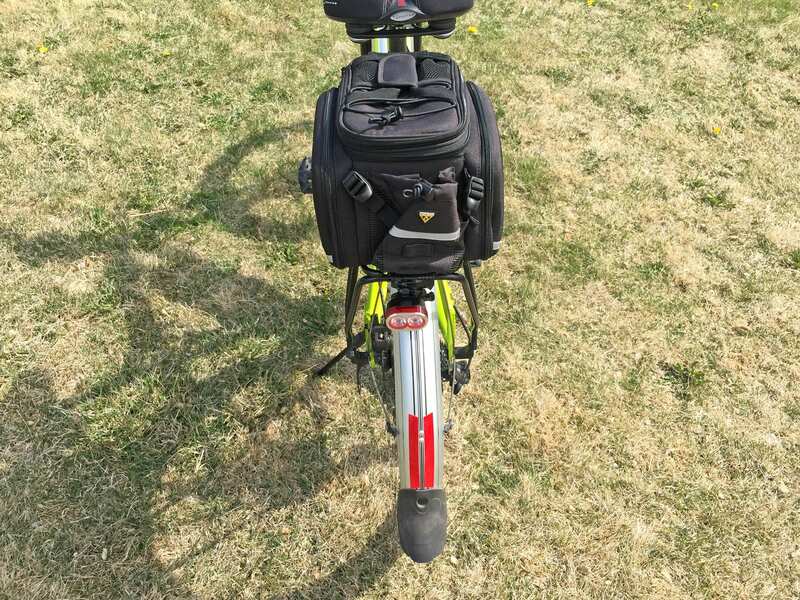 When you mount and dismount the pack, using the included key, the battery comes very close to touching the frame and can be a little tricky to line up. I’m happy that they kept the top tube low and sloped to make the frame easier to mount and stand over (along with the smaller 26-inch wheel size) but noticed that there was no extra space for bottle cage bosses or frame bags in the main triangle. 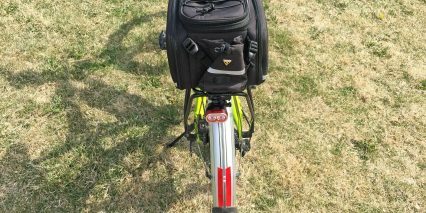 You’d probably have ot remove the battery when mounting this bike on car and bus racks that suspend the bike from the top tube. 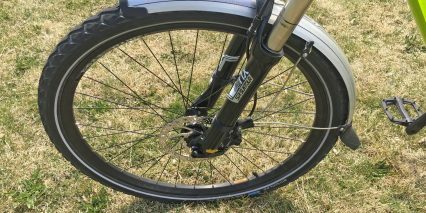 Furthermore, the brake and shifter cables are both run along the base of the top tube and could get in the way when lifting or mounting the bike. The second consideration I wanted to share is that the battery mount interface here uses two spring loaded pins that make contact with the base of the battery pack. I was told by another supplier, who uses a very similar battery interface, that these pins can get a little stuck over time as water and dust build up. That brand recommended using lithium grease spray and a tooth brush to occasionally clean the two pins… so I’m passing that tip on to you here ;) feel free to share your own experiences and tips below in the comments or in the Optibike forums. 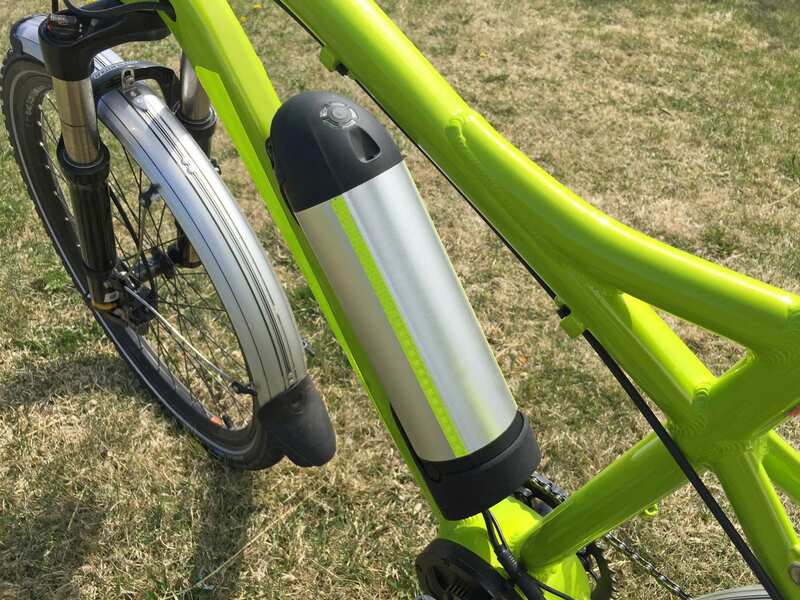 When you’re ready to take a ride on the Rocky Mountain Commuter, just charge and mount the battery pack, click the toggle switch to on (the solid line portion of the button), and press the little rubber power button at the center of the control pad for a couple of seconds. It boots up quickly and provides lots of screen space, making it easy to read if you’re near sighted like me. While the display is not designed to be removable, it does swivel forward and back to help reduce glare. 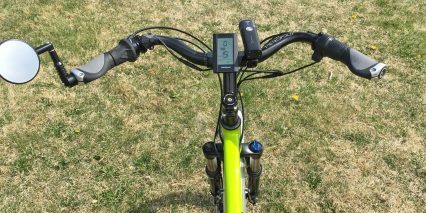 Being mounted front and center, just above the stem, the display leaves room on both sides for the light and button pad. The control pad is fairly simple to reach and use, with just three buttons, but it can do quite a few things. When the bike is switched on, the default level of assist is 1 and that means that throttle is active. For this reason, I recommend keeping the bike off when mounting and dismounting. The + and – keys on the control pad adjust the assist level from zero to five. It appears that the throttle is only active when you’re in 1-5 and not zero, so that level could be used for mounting/dismounting or just reading the display while pedaling manually. 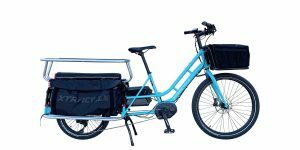 Weighing in at roughly 54.2lbs, the RMC was lighter than I expected given all of the accessories, rack, bag etc., and it pedaled efficiently. Tapping the power button one time while the display is active will switch from current speed to average speed and then max speed as well as odometer to trip meter. Tapping it two times in sequence while the display is active will open the settings menu where you can adjust units, top speed, brightness, and other settings. You can clear the trip distance by holding + and – simultaneously and you can activate backlighting by holding +. Finally, you can activate walk mode by holding the – key, or you could twist the throttle gently. All in all, the display and control pad are a good fit for this electric bicycle because they are easy to interact with. The button pad is mounted within reach of the left grip, but I would caution that the plastic flaps with the + and – icons on them are vulnerable to getting bent upwards. This happened to me once while demoing another ebike because I was wearing a loose coat with long sleeves. Just be careful, the buttons aren’t quite as durable as rubberized keys but they are easier and more satisfying to click in some ways. 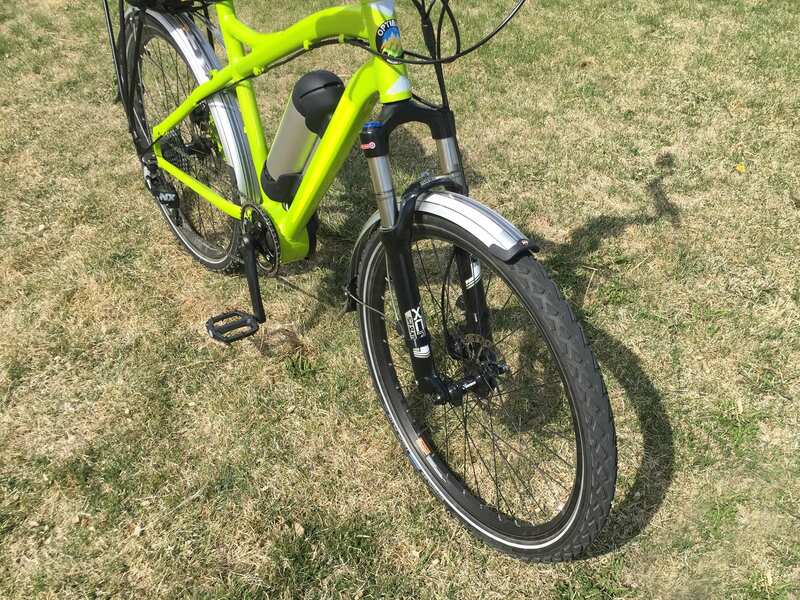 Thanks for getting out to do an Optibike review. 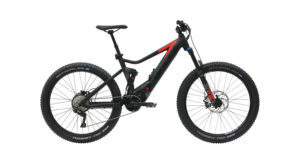 Any chance you got to review the new carbon R15? 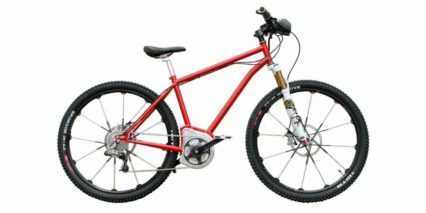 Looking at the comments section, I am amazed at how Optibike gets so much push back for their costs. Value matters, no doubt, but has anyone surveyed the number of bikes selling for over 4k these days? Thanks Court. I look forward to your observations/comments. I would love to hear a real world review on the R15. 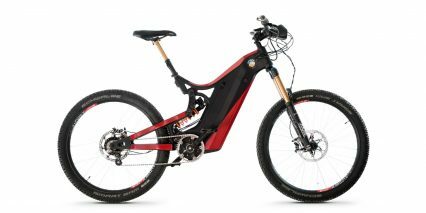 The specs are impressive: 1650W, 29AHr/1500Whr, full suspension, carbon frame… and it does have pedals that work! Does it feel familiar to anything else you have ridden? Weight estimated at what? 75lb? If only that proprietary MBB controller had a PAS option! To their credit, the platform does offer 5 levels and a more linear throttle. I have found that walk/push mode is too fast for me. You remarked that walk mode with this bike was a little too fast for you. 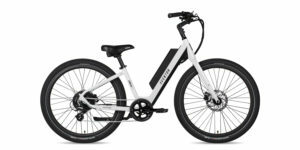 My experience with only 2 different ebikes is that walk/push mode is too fast for safe walking in a situations when I would hope to use it. The situation where I would hope to use walk mode is when I need to dismount in an area with pedestrians: walking the bike to a locking area or just encountering a crowd. I found walk mode acceleration too strong and the ultimate sustained speed to be too fast for safe use by me. 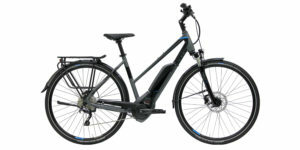 The manual for one of the ebikes recommended never using walk mode unless the rider was mounted on the bike, because it would be easy to lose control. My feeling about walk mode might be biased because I am relatively short (5’6” and inseam 28”) and older (>70 years). The walk/push mode I have experienced requires holding down a button for a few seconds while nothing happens and then the motor suddenly kicks in quickly at full force. I have found that if I am already walking when I apply walk mode, I feel the bike’s attempt to escape is less violent. I wish walk would gradually ramp up its force. The goal speed for walk/push mode seems too fast (~6 km/h). I can walk that fast, although I almost feel I need to start jogging, but mainly I do not feel I have enough control to walk at that speed when other people, pets, or property are at risk. Maintaining a consistent safe speed in walk mode is difficult given its full force or off nature. You have more experience than I with varying walk mode implementations. 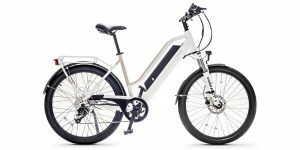 I would like it if your reviews would have a sentence or two about how well the walk mode was implemented by ebikes with it. Additional Thoughts: was there any research done to determine the walk mode target speed? I wonder whether having walk mode speed being determined by assist level might be useful such as lowest level assist – 1 or 2 km/h, highest level – 6 km/h with increments for intermediate levels. One negative is that a rider accustomed to low level walk mode might be surprised by the high level. 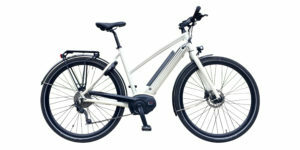 Riders of ebikes with walk mode should test and practice using it in safe situations instead of assuming it will work the way they would like.